Tahoe Joe's Famous Steakhouse: About half a mile from the hotel. A steak and seafood restaurant. Black Oak Restaurant: Walking distance from the hotel. A coffee shop style restaurant that serves American style food. Clay Oven Bar - Grill: Indian cuisine with Thai options and a full bar just a 4 minute walk from the hotel. Leilani Room: Book your next event at the Holiday Inn Express Vacaville. Meeting room prices include tables, chairs, table linens, ice, coffee, water, set up and clean up. Additional fee for chair covers and centerpieces. Full day pricing is 8:00am to 5:00pm. Travis Air Force BaseThe Travis Airforce Base is only 15 minutes away from the hotel which is convenient to all military personnel and their families. Vacaville Premium OutletsWalking distance from the hotel with over 200 stores including Nike, Coach, Gucci, Gap, Guess and much more. Napa Wine CountryEnjoy wine tasting and visit some of the greatest wine makers such as Robert Mondavi, Hendry Wineries and much more. The hotel is only about 30-45 minutes away from Napa. 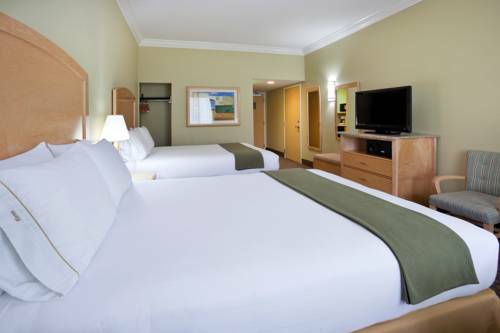 UC DavisThe hotel is only about 15-20 minutes from UC Davis which convenient for students and their visiting family. Jelly Belly FactoryA great place to bring the young ones to enjoy and learn how jellies are made. Families can have tours. Nut TreeA great shopping center with history.